Today, court hearings resume in the case where the Owino Uhuru community and the environmental rights organisation Center for Justice, Governance and Environmental Action (CJGEA), together are challenging state and non-state actors’ responsibilities to ensure the right to a clean and healthy environment in Kenya. Civil Rights Defenders provides witness support through security trainings and temporary relocation of environmental human rights defenders taking part in the court hearings. “Through our media project “Tuna Sauti”, CJGEA advocated for a closure of a harmful metal refinery, and for compensation and justice for victims of this negative and hazardous industrial establishment in the Owino Uhuru community. But the severe harassment and intimidation of several of our colleagues while they were working on this project led us to take the process one step further and file this case in the Mombasa court. It is time to demand justice and put an end to this negative development. Not only in this community but across Kenya”, said Habiba Fora, Media and Communications Officer at CJGEA. When a metal refinery was established in the Owino Uhuru community in Mombasa County, Kenya in 2008, many community members initially welcomed the industry. Promises of jobs and opportunities for steady incomes were much welcomed in a region with high unemployment and few possibilities for a secure economic future. Within short, signs of severely negative environmental effects of the industry were detected. Reports of children and adults in the community showing signs of lead poisoning, together with a range of other visible environmental degradation led the environment rights organisation CJGEA to implement the project “Tuna Sauti”. 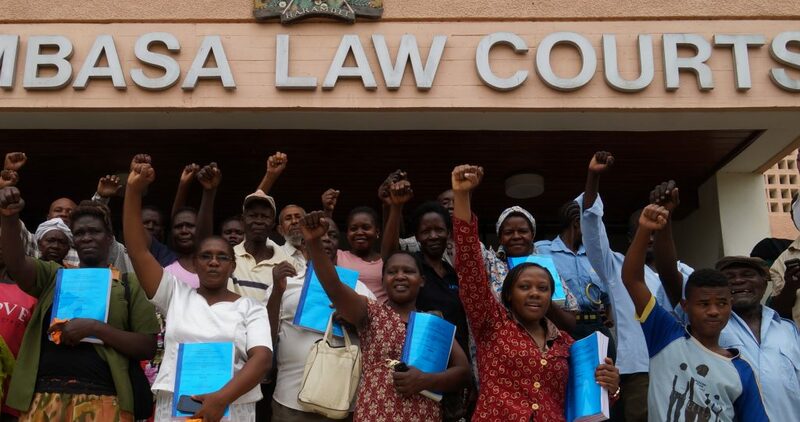 In 2016, the Owino Uhuru community and CJGEA thus decided to file a joint class action litigation case in the Mombasa court to challenge the responsibility of the state and non-state actors regarding the right to a clean and healthy environment. Since CJGEA started the “Tuna Sauti” project, 16 environmental rights defenders have been arrested and intimidated, both through judicial harassment by the local court and through threats from unidentified sources believed to have connections with the commercial interests of the industrial sector. “Human rights defenders focusing on environmental issues are among the most targeted of all, both in the East Africa region and globally. The serious threats received by persons who stand to witness in this important court case are the main reason for Civil Rights Defenders to provide emergency support. The increased security this support offers can empower CJGEA and their members in their efforts to demand that local and national duty-bearers fulfil their responsibilities”, said Marcin de Kaminski, Program Director for the Human Rights Defenders at Risk Department at Civil Rights Defenders.